Invasive species pose a threat statewide and officials are working to help educate Nevada residents about them during this week’s observance of National Invasive Species Awareness Week, which continues through Friday, March 2. Lake Mead National Recreation Area As part of the Department of the Interior’s Safeguarding the West from Invasive Species initiative, federal and state partners gathered at Lake Mead National Recreation Area on Dec. 6 to conduct an assessment of the National Park Service and Nevada Department of Wildlife quagga control programs. 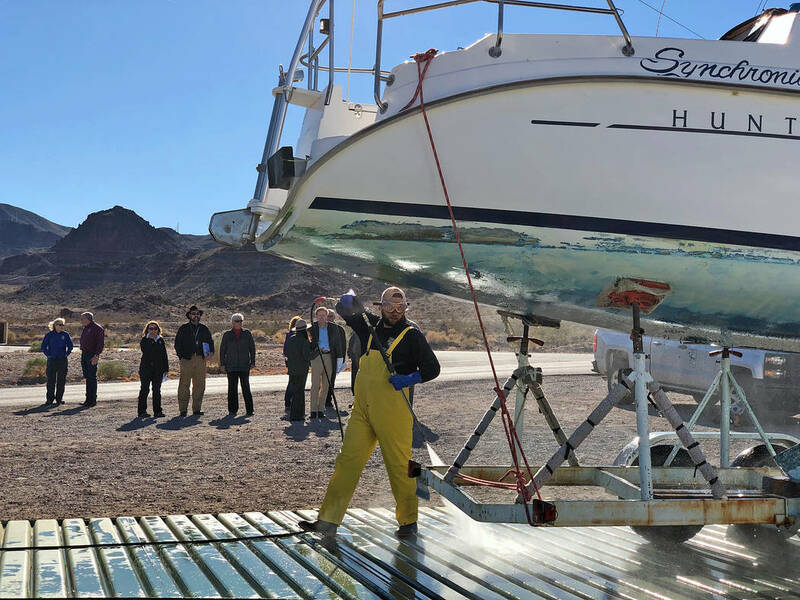 The group visited one of the park’s 11 decontamination stations and witnessed the hot wash of a large sailboat. The Nevada Department of Conservation and Natural Resources is working to raise awareness of the threats posed by invasive plants, animals and microorganisms and the effects they can have on native ecosystems and harm they can do to agricultural food production and public health without measures to keep them under control. Whether it be an invasive insect pest or a non-native invasive grass, these species can increase the threat of wildfire, degrade water quality and undermine recreational opportunities within the ecosystem. For example, invasive weeds can clog waterways, kill native trees and shade out crops and native plants. In Nevada, some of the most significant invasive species include cheatgrass, whitetop, asian clams, zebra quagga mussels, tamarisk and knapweed. Christie Vanover, spokeswoman for Lake Mead National Recreation Area, said they are working to educate people about invasive species through social media. Within the recreation area there are invasive plants and animals, including the quagga mussel, which is one of the most notable in the park. According to Vanover, the mollusks vary in size — from microscopic to the size of a quarter — and were first discovered in Lake Mead in 2007. They are also found in Lake Mohave. Adult mussels may attach to water intakes, marina structures and boats, which is why it’s very important for people to “Clean. Drain. Dry.” any equipment that comes in contact with the water so that it doesn’t spread to other bodies of water, she said. On Wednesday, Feb. 28, the U.S. Department of Interior released a report highlighting the progress made against fighting invasive zebra and quagga mussels, noting that the department spent $8.6 million nationwide in fiscal year 2017 to address the issue. Additionally, the Bureau of Reclamation spent $1 million to establish watercraft decontamination stations, provide educational materials and continue monitoring efforts. The bureau also committed another $150,000 this year to bolster its efforts. The Department of Interior is working on more than four dozen actions to address invasive mussels including preventing the spread of the species to uninfested waters, and containing and controlling them where they are established, such as in Lake Powell and the Lower Colorado River region. The department requested $11.9 million for fiscal year 2018, including an additional $3.4 million for the Bureau of Reclamation to expand on these and other efforts to prevent, contain and control invasive mussels. Approximately $3.1 million is in the process of being released to support activities such as the purchase and operation of watercraft inspection and decontamination stations in the Lower Colorado River basin. To learn more about the Nevada Department of Conservation and Natural Resources or other invasive species initiatives, visit http://dcnr.nv.gov/.